Tooth abscess is one of the most common causes of oral swelling. An abscess is a localized collection of pus surrounded by inflamed tissue located on the gums around the tooth. It usually originates from a bacterial infection due to tooth decay or severe periodontal disease but a failed root canal therapy treatment can also lead to abscess formation. Management: Drainage of pus and antibiotic medications. Causative factors should be removed. Amyloidosis © Michael Kahn, D.D.S. A disorder characterized by deposit of amyloid (a waxy translucent complex protein resembling starch that results from degeneration of tissue) in organs or tissues and is often secondary to chronic rheumatoid arthritis, tuberculosis or multiple myeloma. Chronic gingivitis is the term used for the inflammation of gums and is generally due to the long-term effects of plaque deposits. Chronic gingivitis can be seen in most of the population and it is characterized by tender, swollen, red gums that bleed easily and may be responsible for bad breath in some cases. Management: Practice good oral hygiene with proper tooth brushing techniques, floss and mouthwash. Make regular appointments with your dentist to ensure your mouth stays healthy. Gingival cysts can appear in newborns (Bohn’s nodules, Epstein pearls) or adults. Both cysts are usually painless swellings on the gums and could arise from developmental remnants. Management: The majority of newborn cysts break by themselves, a few days after birth though some may remain for several months. Cysts in an adult can be surgically removed. 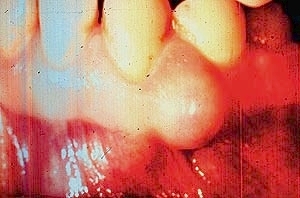 A range of drugs can produce gum swelling. Most commonly phenytoin (for epilepsy), ciclosporin (an immunosuppressive drug) and calcium-channel blockers (especially nifedipine, mainly used as anti-hypertensive agents). Management: Practice good oral hygiene and usage of a chlorhexidine mouthwash may be helpful. 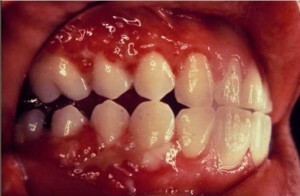 Enlarged tissues can be excised but gum enlargement will tend to reoccur unless the drug has been stopped. The physician may be willing to substitute another drug to treat the medical problem. Exostoses are benign outgrowths from bone and are usually seen like protrusions from the gums. Management: No treatment needed unless obstructive to daily life. Epulis fissuratum © 2008 Elsevier, Inc. 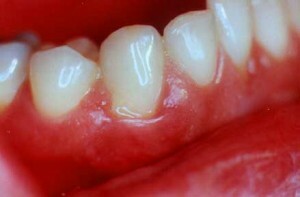 The peripheral “fibroma” also called fibrous epulis or peripheral fibrous hyperplasia is a localized mass of tissue that generally develops on the gums between teeth and mostly affects women. It could be due to trauma and there are usually no symptoms. Management: Surgical removal of the tissue mass. To be continued in Part2. Painful gums? Red, white or pigmented gums? Read more about the various causes for them here and here. What is Deep Gum and Root Cleaning? I’ve been wearing dentures for nearly 60 years with no problems–put them in & go. Lately I’ve had gum swelling and can’t wear my teeth. I tried using goo & it helps but still have irritation and swelling even if I only wear them when I go out. l took a round of penicillin to no avail. There is no bleeding or external damage obvious. I take warfarin, atenolol, levothyroxine, Lasix, meclizine, and spironolactone for brain, heart. and liver damage. Could any of these drugs be affecting my gums? Thank you for your feedback. From what I know of, those drugs that you mentioned have very low possibility of causing swollen gums. It is best you consult a dental professional to inspect your mouth condition.